Breast Cancer Therapeutics Market Analysis « Global Market Insights, Inc. 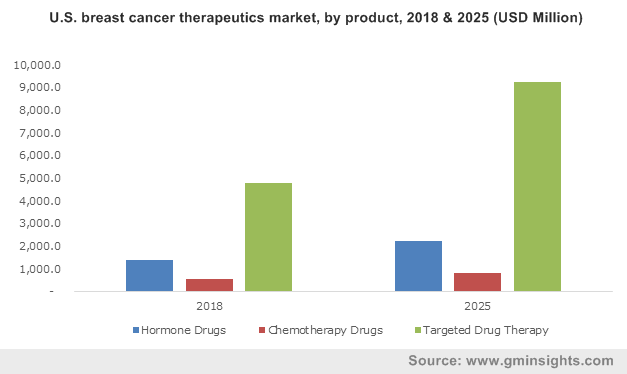 Breast cancer therapeutics market has gained an appreciable popularity over the past few years with the advent of novel drugs addressing specific actionable targets. The commercialization potential of the industry is quite evident from the estimates depicted by Global Market Insights Inc., that claims that breast cancer therapeutics market size to exceed a valuation of USD 28 billion by 2024, primarily backed by the increasing patient pool suffering from breast cancer. Statistics depict, worldwide, incidence of breast cancer has witnessed a tremendous surge over the recent years, with an estimated figure of almost 1.7 million new cases being diagnosed yearly. In fact, as per WHO’s updated report of 2015, approximately 520,000 casualties result from breast cancer every year. The aforementioned figures itself are testimony to the huge opportunities that breast cancer therapeutics market is yet to unfold. Speaking along similar lines, it is further prudent to note that U.S. experiences a stronghold in the global breast cancer therapeutics industry, subject to the growing occurrence of breast cancer in America. A latest estimation brought forth by the American Cancer Society for the year 2017 claims that U.S. would witness 63410 cases of CIS (carcinoma in situ) and 252,710 cases of invasive breast cancer this year. The report further states that unfortunately around 40,610 women casualties are likely to result from breast cancer. The massive upsurge in the occurrence of breast cancer has upscaled the demand for high-end breast cancer treatments, leaving a subsequent impact on the regional breast cancer therapeutics market size. U.S, having pegged the title of one of the most profound participants in the global business space, is expected to contribute significantly toward the global breast cancer therapeutics industry share in the ensuing years. Another vital trend providing a substantial push to breast cancer therapeutics market size is the advancements in healthcare infrastructure. Of late, the expanding healthcare business space is blazing with abundance of innovations by renowned giants who have been incessantly attempting to effectuate commercialization of innovative drugs that prove to be extensively beneficial for the consumers – a trend that is leaving a perpetual impact on the product matrix breast cancer therapeutics market. As per a recent news snippet, scientists at Institute of Cancer Research, London, have come up with a breakthrough solution for breast cancer patients, which reportedly obliterated all signs of breast cancer in 11% patients within a span of 11 days. The drug was allegedly manufactured by blending two cancer drugs – lapatinib (Tyverb) and trastuzumab (Herceptin), and aided almost 17% of the patients with shrinking of tumors so significantly, that the patients didn’t even require chemotherapy post the drug application. Lately, the overall breast cancer therapeutics market has been fiercely competitive with the engagement of leading giants such as Roche Diagnostics, Novartis, Eli Lilly, Eisai, AstraZeneca, Celgene, Pfizer, and Sanofi. Product differentiation is a major growth strategy incorporated by these market players. Ongoing developments in clinical trials have led to the emergence of novel therapeutic approaches that identifies and addresses specific biological targets. Though only a fraction of renowned giants offer therapeutics for breast tumor as of now, experts claim, breast cancer therapeutics industry to witness substantial expansion in the coming seven years, characterized by the strong participation by the SMBs toward the development of novel drugs and outcome based solutions. In terms of y-o-y growth, the global breast cancer therapeutics market is estimated to register a CAGR of 9% over 2017-2024. This entry was posted in Healthcare & Medical Devices and tagged Breast Cancer Therapeutics Industry, Breast Cancer Therapeutics Market, Breast Cancer Therapeutics Market Analysis, Breast Cancer Therapeutics Market Growth, Breast Cancer Therapeutics Market Outlook, Breast Cancer Therapeutics Market Pdf, Breast Cancer Therapeutics Market Price, Breast Cancer Therapeutics Market Report, Breast Cancer Therapeutics Market Share, Breast Cancer Therapeutics Market Size, Breast Cancer Therapeutics Market Trends.